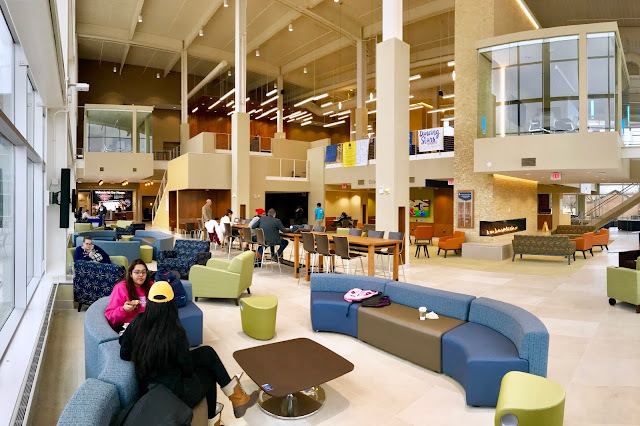 The University of Illinois Springfield’s new Student Union building was honored with a Facility Design Award of Excellence from the Association of College Unions International (ACUI) during a ceremony in Indianapolis on March 25, 2019. According to the ACUI, the award encourages and recognizes excellence in the design of student-centered facilities that support campus community building and student learning. In reviewing the building, ACUI assessed criteria, such as the building’s connections with the community, campus and environment in which it sits. They also reviewed the planning and design process, including how the use of creative materials, input from students, and inclusion of partners shaped the project and its goals. The UIS Student Union was designed by Workshop Architects of Milwaukee, Wisconsin & Dewberry of Peoria, Illinois to LEED® Gold guidelines, with sustainable features which include a green roof, energy efficient lighting, rainwater reclamation system and radiant flooring in select areas. Since the building’s opening in January 2018, the Student Union has helped to energize campus life, creating a vibrant social environment in the heart of campus. This is the second design award for the building. In November 2018, the building was honored with an excellence in design award from the American Institute of Architects (AIA).